Today one of the most vile men in the history of America has passed away. Fred Phelps, the former civil-rights attorney turned fundamentalist-Primitive Baptist Pastor, known primarily to his opposition to Homosexuality that was utterly vitriolic. His Church, which consists primarily of Family Members, is well known for protesting at funerals saying that almost everything bad under the Sun that happens is happening because of the acceptance of Homosexuality. Their protest signs are well known with “God Hates Fags” and “Thank God for Dead Soldiers”. For a long time I remember seeing posts on the internet with people talking about protesting at his funeral in “revenge” for his protesting at the funerals of American soldiers killed in Action, and other victims of violence. And yet today I have seen NOT ONE posting on Social Media that is hateful towards Phelps on this, the day of his death. I have seen friends post of Social Media asking for prayers to God for Mercy on Phelps. And, this isn’t coming from Christians on just one side of the moral issues surrounding Homosexuality. I have seen it from Gay Christians and their allies. I have seen it from Christians who think homosexuality is a grave sin but thought Phelps and his church were horrid and disgusting. I have not seen one person post anything hateful about Phelps today. And it makes me hope. A lot of the time I see the worst in people be brought out on the Internet. Not so today. Today I might have seen the best. Fred Phelps was a vile and hateful man. We need to remember that God, in his infinite mercy, can forgive Fred Phelps of his wickedness he can surely forgive us. Amen. Some of you might not be surprised at all to learn that I am a bit of a sci-fi nut. I know, I know. Shocker. I have asked the questions around before, but I think is still relevant: If there is intelligent life out there do we as Christians need to Evangelize. Now, given that we are presently not in contact with Extra-terrestrial beings (at least that I am aware of) the question seems slightly moot. However, the Universe is really, really big. Our Galaxy alone has about 100 Billion stars in it. The entire observable Universe has 1022 to 1024 stars in it. Even if one was assume the chances of sentient life occurring was astronomically small the fact that the cosmos is so utterly huge makes the chance we are alone in the universe to be extremely small. From a Christian viewpoint we run into an issue of having to ask ourselves If God created the Universe only for Humans then Why did he make it so utterly big? 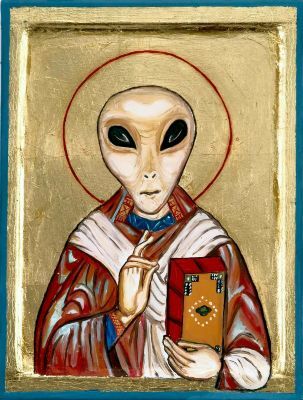 There had been some discussion by some Catholic Theologians on the question that if Aliens existed they might have never experienced a fall like man did; They might already be in perfect Communion with God. While I find this idea fascinating I don’t think this is likely. However, if their are Alien species out there that have experience a similar fall from Grace like humans then, yes, they would be in need of redemption. But maybe not quite the same one we have. We are also told by Christ himself to Go out and “make disciples of all nations, baptizing them in the name of the Father and of the Son and of the Holy Spirit”. So, if we encounter Aliens does this commandment from him apply to us? In the Beginning of John’s Gospel we hear how the Word, Jesus, was made Flesh. So as St. Athanasius was concerned “The Son of God became man, that we might become god”. I would categorically state my belief that if we did run into Aliens it certainly wouldn’t hurt to educate them about Christianity, and other religions of Humans, but that it is unnecessary. Simply put, the salvation of their own Species might involve having their own Christ; An incarnation of the Son of God becoming one of them. Now, this doesn’t mean that I am saying there is more than one Son of God, the second person of the Trinity. What I am saying is as far as I understand soteriology in that an incarnation of a Man-God was necessary for the Salvation of man so to would the Salvation of another species. What it is like to work with the Archbishops? Note: I am not crazy. Some of this is based on Fiction. Play along. Some people (okay, no one) ask me the question: What is it like to work with two of the finest minds the Church has ever seen when supporting Lent Madness. I tell them that it is awesome. During the competition we, the voting public of Lent Madness, make a LOT of commentary on what we think is going to happen. The fact of the matter is that although we are all voting in the Contest we aren’t the Contestants themselves. And, we can tell from sporting and politics that some of the best commentary, and the best insight comes from veterans who have actually been in the running. 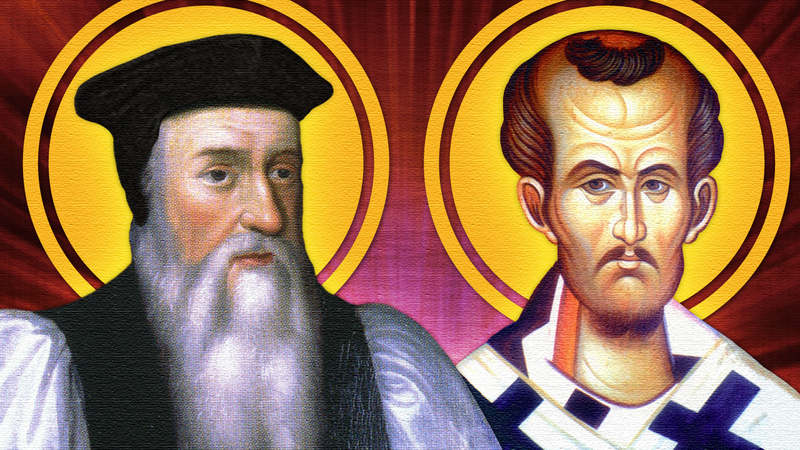 The issue with having a Contest involving Saints running is that Saints are, by very definition, dead and in heaven. There are a few, untrustworthy methods to communicate with the dead such as Ouija boards or Psychics. I didn’t think that would at all worthy of the competition and resigned myself to not being able to help out. However, in early January 2013 I heard about a special, experimental device being developed in a top secret laboratory by a company that does not want to be disclosed. They wouldn’t let me buy one, however, they did let me lease one. The damage deposit was considerably high. I was able to do obtain the deposit in part from a grant by SnobPAC: The Political Action Committee (aka slush fund) supporting the infamous ChurchSnobTEC elected the next Presiding Bishop of the Episcopal Church. After the device was sneaked through the world’s longest undefended border I was able to take possession of a Clairvoyatron 2000. With my brand new Black Box in hand (sorry, I can’t show any pictures of it due to a Non-Disclosure Agreement) I then had to spend the time setting it up and then reading the vast amounts of documentation. Let me tell you folks there are a lot of rules to using one of these. For example Speaking with any deceased friends, or any relatives less than five generations back is strictly prohibited. Also, we are advised not to attempt to speak with any souls in the fires of hell as it “Could lead to a catastrophic failure of the device resulting in the destruction of the whole Universe”. Geez, if that could happen why not put in a safety mechanism to stop me. Not being able to state what the true Theological opinions of the Church should be on matters that we still consider rather controversial down here. Apparently we are suppose to work that stuff out for ourselves. Can’t call the realm of the damned by the name we use a lot here on Earth and just refer to it as “That Other Place”. Wouldn’t call Satan by his name; He is always referred to as “You Know Who”. If they break any rules they get sent to “The Penalty Box”, which is a part of Heaven near “That Other Place” where they have to wait until Holy Saturday. The Archbishops and I decided to do some test footage for the two play-in rounds that occurred that year. With the blessing of the Supreme Executive Committee I continued to work with the Archbishops throughout Lent Madness 2013. However, there was something missing. For starters people could only hear their voices. I gave some feedback to the makers and over the Summer of 2013 the Clairvoyatron 2000 was replaced by a slightly Clairvoyatron 2100. At the time it had upgraded hardware but had the same Firmware as the 2000. It wasn’t until the fall that the first of Several firmware upgrades went through allowing them to manipulate portraits. The result, I feel, is a better version for the Voting Public of Lent Madness. Sadly, we are still stuck with the same lame computer voices; Something the Archbishops bug me about constantly. So, there you have it. A brief story of how I came to get a Clairvoyatron and produce the videos for Archbishops Thomas and John. Many of you would might think I am going to use this post to plug for Lent Madness. The answer to that is a firm no. Today is the beginning of Lent; The penitential season of Prayer, Abstinence and Fasting before Easter. We typically view Lent as lasting Forty-days in keeping with the Forty-days that our Lord spent in the desert. It does in fact last Forty-six (46) days as the Sundays in Lent are treated as “mini-Easters”. Thus, the Forty-days of Lent gets extended to Forty-six. I am going to be honest with you; This is perhaps one of most favourite Collects of the church. And, this isn’t some Collect that was cooked up by some liberal theology in the last century and posed in traditional English. This is, as cited, from the 1662 Book of Common Prayer; Other than some minor spelling modifications this is the original English-language prayer from the first Book of Common Prayer back in 1549. Yet, the prayer goes back to the Latin-version used in the Sarum Missal. So, we are left with the stunning fact that we, as Anglicans, have believed since the very beginning that God hates nothing that he has made. Nothing. Not the CEO who just laid off half of his employees. Not the Child molester. Not the man who cheated on his wife. Not the murderer. Not the thief. And, most importantly, not you. God does not hate you. It is also important to note that God forgives the sins of all the penitent. Being penitent doesn’t mean that you proclaim “I have sinned”; It more importantly means “I have sinned, and I am truly sorry for having sinned”. Forgiveness of your own sins involves acknowledging that you are a sinner and that you are truly sorry for your sins. Have mercy upon me, O God, after thy great goodness : according to the multitude of thy mercies do away mine offences. Wash me throughly from my wickedness : and cleanse me from my sin. For I acknowledge my faults : and my sin is ever before me. Against thee only have I sinned, and done this evil in thy sight : that thou mightest be justified in thy saying, and clear when thou art judged. We, as Christian, acknowledge that we can’t be cleansed from sins on our own; We need God’s help to do that. Lent, in particular Ash Wednesday, is the perfect time to acknowledge that you are a sinner. Don’t worry, I am not judging you as I am likely a worse sinner. Some of you who follow me on Twitter might have an idea what I am talking about. For those that don’t then here is my explanation: There are many in society who feel that Christianity, especially Christmas and to a lesser extent Easter, are “under attack” by the forces of Secularism and Atheism. You might hear about a lot of this from places like Fox News. 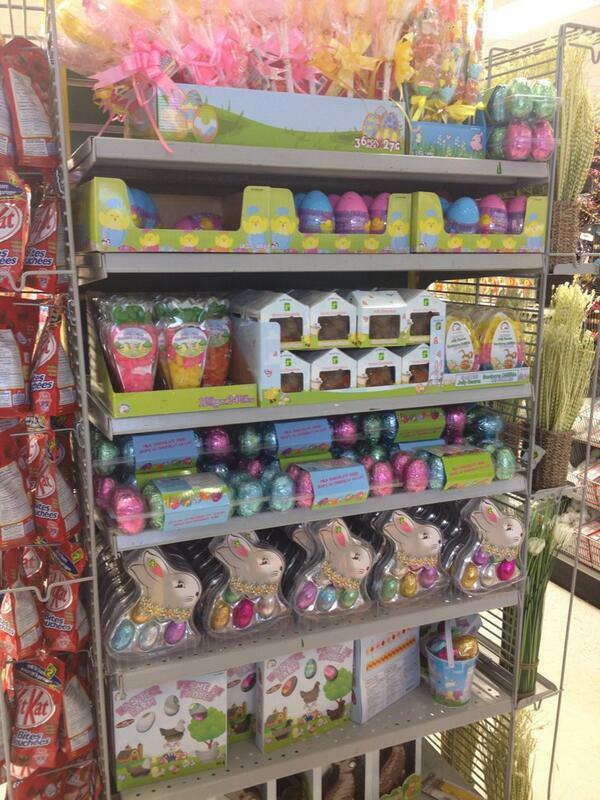 Shock of shock, horror of horrors: there is Easter Candy out before it is even lent. My wife informed me this story had it out in early February as far as she could recall. Now, I like to think I am a reasonable man. However, I have held for a long time that the commercialization of Christianity, in particular the Feasts of Christmas and Easter, are far more a danger to our faith than things like a Town not being able to put up a Nativity Scene on public property. When Christmas decorations go up in shopping malls in October before the season of Advent and Easter candy is in the stores before Lent than we realize that our faith is under attack by the Almighty Dollar. This year I have decided to keep a Diary, of sorts, during the Lenten season. No doubt that groups like Fox News will be sounding the airwaves about the “War on Easter”, however, it seems that groups like that are missing the War on Lent. And that, my friends, is truly more frightening for me.